Today, a great author has died, aged 91. Michael Bond wrote extraordinarily good books. The most well known are of course the books about Paddington Bear (from Darkest Peru). He also wrote a wonderful series of books about a guinea-pig: opinionated and full of character and he wrote others about a mouse called Thursday. This is by no means a comprehensive list of his books…there are others – do look them up on Fantastic Fiction. Paddington has become an institution. I grew up with Peggy Fortnum’s illustrations (I still think they are the best) and the original television series. More recently there have been new titles, and some of the old stories have been abridged and illustrated by someone called RW Alley. I’m afraid I always feel that those are of a different bear, perhaps Paddington’s cousin, pretending to be Paddington. Peggy Fortnum’s pictures really are the original, and…the best. More recently ‘they’ have made a new series about him on television and of course there was that film about him. I am told that younger readers prefer the picture books as an introduction. Does he need one? I’m of the opinion that this isn’t necessary – when readers are ready for Paddington, they should have ‘the real thing’ – and not be presented with something less…but that is just my opinion – and the world would be a very boring place if we all agreed…. 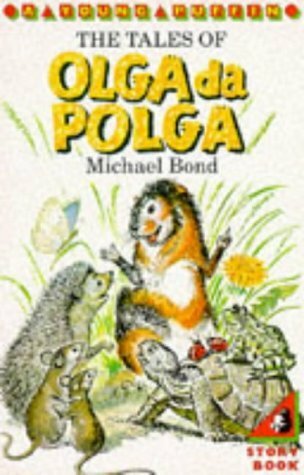 The Olga Da Polga books were a brilliant series for me. Her adventures with Noel the cat, Graham the tortoise, Fangio a hedgehog (who encourages Olga to visit the Elysian Fields), two hamsters and Venables the local toad are wonderful, written in the same beautiful style as Paddington, clear and with good English. Not so well known, and different, but I will never forget Olga’s affair with Boris, who lived in a castle and with whom she had a family…I remember the photograph of them fell into her water bowl…. Then there was the small series, which started with Here Comes Thursday – an adventure series about a mouse and his friends, that I remember with affection. I am sad at Michael Bond’s parting – he has given me great joy, and I wish I had met him, so I could tell him of the pleasure his writing has given me over the years. He was, I think one of the great writers. He seemed a quiet man, from an age, when things were better. I never met him, but from what I have read and heard, he was a gentleman in an era where gentleness seems to be disregarded. Perhaps it is better for him to have gone as he has. If you haven’t read the Paddington books, because your parent’s were busy doing other things and not buying you the books they should, or you missed Olga Da Polga, then you should buy them as individual volumes and take a little to appreciate the quality and the charm of this author’s writing. Each chapter is a story within itself – so there is no need to worry. Just enjoy each as a little piece of joy whilst enjoying a small, or large pile of marmalade sandwiches. There were 9 original Paddington volumes ( the first is A Bear Called Paddington) and around two dozen Olga da Polga books. All can be purchased easily. Some of the Paddington books have been bound up into a single volume…with Peggy Fortnum’s illustrations – coloured in a slip case. Olga Da Polga can be bought in paperback editions. If you feel that buying a set of Paddington or Olga da Polga is beyond your means, you can, of course buy A Bear Called Paddington with Peggy Fortnum’s illustrations in hardback (ISBN 9780007528622) which would be a lovely way to commemorate this author. You can also purchase The tales of Olga Da Polga, illustrated by Catherine Rayner. 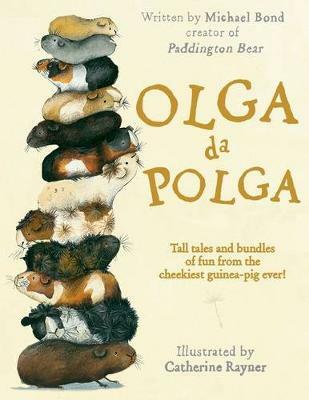 Also in hardback (ISBN 9780192737410) – Catherine Rayner is not the original illustrator – but her pictures are charming in themselves, and you can’t get hardbacks of the original editions of The Tales of Olga Da Polga. Why hardbacks? They last longer. Then again, you could just buy the paperback books individually over time. Perhaps having a day out and a picnic with marmalade sandwiches as you read each book.